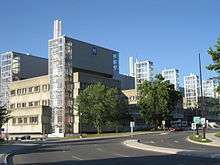 The Uniklinikum Aachen in Germany is one of the biggest hospitals in Europe. A hospital is a health care institution providing patient treatment with specialized medical and nursing staff and medical equipment. The best-known type of hospital is the general hospital, which typically has an emergency department to treat urgent health problems ranging from a broken arm to a heart attack. 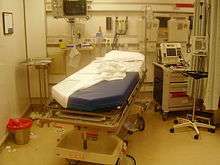 A district hospital typically is the major health care facility in its region, with large numbers of beds for intensive care and additional beds for patients who need long-term care. Specialised hospitals include trauma centres, rehabilitation hospitals, children's hospitals, seniors' (geriatric) hospitals, and hospitals for dealing with specific medical needs such as psychiatric treatment (see psychiatric hospital) and certain disease categories. Specialised hospitals can help reduce health care costs compared to general hospitals. A teaching hospital combines assistance to people with teaching to medical students and nurses. The medical facility smaller than a hospital is generally called a clinic. Hospitals have a range of departments (e.g. : surgery and urgent care) and specialist units such as cardiology. Some hospitals have outpatient departments and some have chronic treatment units. Common support units include a pharmacy, pathology, and radiology. Hospitals are usually funded by the public sector, by health organisations (for profit or nonprofit), by health insurance companies, or by charities, including direct charitable donations. Historically, hospitals were often founded and funded by religious orders or charitable individuals and leaders. In the 2010s, hospitals are largely staffed by professional physicians, surgeons, and nurses, whereas in the past, this work was usually performed by the founding religious orders and members of their order or by volunteers. However, there are various Catholic religious orders, such as the Alexians and the Bon Secours Sisters that still focus on hospital ministry in the late 1990s, as well as several other Christian denominations, including the Methodists and Lutherans, which run hospitals. In accordance with the original meaning of the word, hospitals were originally "places of hospitality", and this meaning is still preserved in the names of some institutions such as the Royal Hospital Chelsea, established in 1681 as a retirement and nursing home for veteran soldiers. During the Middle Ages hospitals served different functions from modern institutions. Middle Ages hospitals were almshouses for the poor, hostels for pilgrims, or hospital schools. 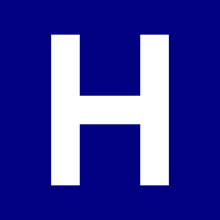 The word "hospital" comes from the Latin hospes, signifying a stranger or foreigner, hence a guest. Another noun derived from this, hospitium came to signify hospitality, that is the relation between guest and shelterer, hospitality, friendliness, and hospitable reception. By metonymy the Latin word then came to mean a guest-chamber, guest's lodging, an inn. Hospes is thus the root for the English words host (where the p was dropped for convenience of pronunciation) hospitality, hospice, hostel and hotel. The latter modern word derives from Latin via the ancient French romance word hostel, which developed a silent s, which letter was eventually removed from the word, the loss of which is signified by a circumflex in the modern French word hôtel. The German word 'Spital' shares similar roots. The best-known type of hospital is the general hospital, which is set up to deal with many kinds of disease and injury, and normally has an emergency department (sometimes known as "accident & emergency") to deal with immediate and urgent threats to health. Larger cities may have several hospitals of varying sizes and facilities. Some hospitals, especially in the United States and Canada, have their own ambulance service. The earliest documented institutions aiming to provide cures were ancient Egyptian temples. In ancient Greece, temples dedicated to the healer-god Asclepius, known as Asclepieia functioned as centres of medical advice, prognosis, and healing. Asclepeia provided carefully controlled spaces conducive to healing and fulfilled several of the requirements of institutions created for healing. Under his Roman name Æsculapius, he was provided with a temple (291 B.C.) on an island in the Tiber in Rome, where similar rites were performed. Institutions created specifically to care for the ill also appeared early in India. Fa Xian, a Chinese Buddhist monk who travelled across India ca. A.D. 400, recorded in his travelogue that: The heads of the Vaisya [merchant] families in them [all the kingdoms of north India] establish in the cities houses for dispensing charity and medicine. All the poor and destitute in the country, orphans, widowers, and childless men, maimed people and cripples, and all who are diseased, go to those houses, and are provided with every kind of help, and doctors examine their diseases. They get the food and medicines which their cases require, and are made to feel at ease; and when they are better, they go away of themselves. The earliest surviving encyclopaedia of medicine in Sanskrit is the Charakasamhita (Compendium of Charaka). This text, which describes the building of a hospital is dated by Dominik Wujastyk of the University College London from the period between 100 B.C. and A.D. 150. According to Dr. Wujastyk, the description by Fa Xian is one of the earliest accounts of a civic hospital system anywhere in the world and, coupled with Caraka's description of how a clinic should be equipped, suggests that India may have been the first part of the world to have evolved an organised cosmopolitan system of institutionally-based medical provision. According to the Mahavamsa, the ancient chronicle of Sinhalese royalty, written in the sixth century A.D., King Pandukabhaya of Sri Lanka (reigned 437 B.C. to 367 B.C.) had lying-in-homes and hospitals (Sivikasotthi-Sala) built in various parts of the country. This is the earliest documentary evidence we have of institutions specifically dedicated to the care of the sick anywhere in the world. Mihintale Hospital is the oldest in the world. Ruins of ancient hospitals in Sri Lanka are still in existence in Mihintale, Anuradhapura, and Medirigiriya. The declaration of Christianity as an accepted religion in the Roman Empire drove an expansion of the provision of care. Following the First Council of Nicaea in A.D. 325 construction of a hospital in every cathedral town was begun. Among the earliest were those built by the physician Saint Sampson in Constantinople and by Basil, bishop of Caesarea in modern-day Turkey. Called the "Basilias", the latter resembled a city and included housing for doctors and nurses and separate buildings for various classes of patients. There was a separate section for lepers. Some hospitals maintained libraries and training programmes, and doctors compiled their medical and pharmacological studies in manuscripts. Thus in-patient medical care in the sense of what we today consider a hospital, was an invention driven by Christian mercy and Byzantine innovation. 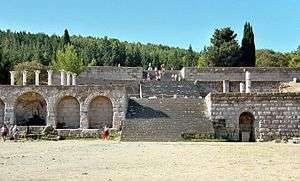 Byzantine hospital staff included the Chief Physician (archiatroi), professional nurses (hypourgoi) and the orderlies (hyperetai). By the twelfth century, Constantinople had two well-organised hospitals, staffed by doctors who were both male and female. Facilities included systematic treatment procedures and specialised wards for various diseases. A hospital and medical training centre also existed at Gundeshapur. The city of Gundeshapur was founded in A.D. 271 by the Sasanian king Shapur I. It was one of the major cities in Khuzestan province of the Persian empire in what is today Iran. A large percentage of the population were Syriacs, most of whom were Christians. Under the rule of Khusraw I, refuge was granted to Greek Nestorian Christian philosophers including the scholars of the Persian School of Edessa (Urfa)(also called the Academy of Athens), a Christian theological and medical university. These scholars made their way to Gundeshapur in A.D. 529 following the closing of the academy by Emperor Justinian. They were engaged in medical sciences and initiated the first translation projects of medical texts. The arrival of these medical practitioners from Edessa marks the beginning of the hospital and medical centre at Gundeshapur. It included a medical school and hospital (bimaristan), a pharmacology laboratory, a translation house, a library and an observatory. Indian doctors also contributed to the school at Gundeshapur, most notably the medical researcher Mankah. Later after Islamic invasion, the writings of Mankah and of the Indian doctor Sustura were translated into Arabic at Baghdad. The Romans first introduced hospitals to Britain during the early Anglo-Saxon period. 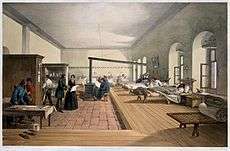 During this period, hospitals were mainly confined to the domestic household or existed as small, military hospitals with the function of caring to the sick, travellers, and of the long-term infirm. More formal hospital institutions came from the advent of Christianity in A.D. 597 :17 During the late Saxon period, monasteries, nunneries, and hospitals functioned mainly as a site of charity to the poor. 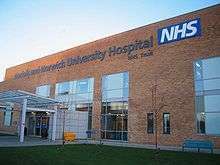 After the Norman Conquest of 1066, hospitals are found to be autonomous, freestanding institutions. They dispensed alms and some medicine, and were generously endowed by the nobility and gentry who counted on them for spiritual rewards after death. In time, hospitals became popular charitable houses that were distinct from both English monasteries and French hospitals. The primary function of medieval hospitals was to worship to God. Most hospitals contained one chapel, at least one clergyman, and inmates that were expected to help with prayer. Worship was often a higher priority than care and was a large part of hospital life until and long after the Reformation. Worship in medieval hospitals served as a way of alleviating ailments of the sick and insuring their salvation when relief from sickness could not be achieved. Three well-documented medieval European hospitals are St. Giles in Norwich, St. Anthony's in London, and St. Leonards in York. St. Giles, along with St. Anthony's and St. Leonards, were open ward hospitals that cared for the poor and sick in three of medieval England's largest cities. :23 The study of these three hospitals can provide insight into the diet, medical care, cleanliness and daily life in a medieval hospital of Europe. St. Anthony's was erected in the thirteenth century (some time before 1254), in the heart of London on Threadneedle Street, atop the less than ideal site of a Jewish synagogue. :43,88 :23 The chapel of St. Anthony's was built in 1310 without permission of the bishop of London. To prevents its degradation, the hospital petitioned for a chapel on the bishops terms. :88 Unlike St. Giles, there was insufficient land at St. Anthony's, London, for recreation or food production. As a result, herbs or 'erbys' and vegetables had to be bought on a daily basis for consumption by the entire community. :178 Accounts of foreign expenses at St. Anthony's also show the purchase of various spices, often with intrinsic medicinal qualities that could alter the level of heat and moisture within the body. Some of the spices bought include, saffron, cloves, ginger, cinnamon, lavender, pepper and mustard. :35 Interestingly, the amount spent on herbs, produce, and spices were far surpassed by the amount spent on fish and meat. According to quarterly expenditure reports, fifty-eight percent of the quarterly budget was spent on meat, thirty-four percent on fish, three percent on pottage, two percent on dairy, one percent herbs and one percent on eggs. :33 The unusually detailed records of diet and expenditures at St. Anthony's have revealed that the diet of the clerical establishment ('the hall') and the diets of the almsmen, patients and children ('the hospital') were quite different and class-based. :179 During a typical week, "the entire community shared dishes of pottage, veal, mutton and eggs; the hall alone consumed pork, ribs of roast beef, duck, fresh salmon and eels; and the hospital was supplied with mutton, plaice and haddock. ":41 It is clear that the hall, or more wealthy, enjoyed extravagant meals of meat and fish, while the hospital, the patients and the poor, were fed simpler and cheaper food. English physician Thomas Percival (1740–1804) wrote a comprehensive system of medical conduct, 'Medical Ethics, or a Code of Institutes and Precepts, Adapted to the Professional Conduct of Physicians and Surgeons (1803) that set the standard for many textbooks. 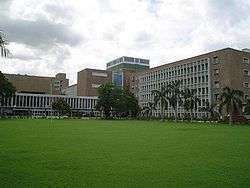 1 2 3 "Narayana Hrudayalaya Hospitals". fastcompany.com. 7 February 2012. Retrieved 13 October 2013. 1 2 3 "India's 'production line' heart hospital". bbcnews.com. 1 August 2010. Retrieved 13 October 2013. ↑ Lovoll, Odd (1998). A Portrait of Norwegian Americans Today. U of Minnesota Press. p. 192. ISBN 0-8166-2832-7. ↑ Cassell's Latin Dictionary, revised by J. Marchant & J. Charles, 260th. thousand. 1 2 3 4 5 "Our Background". District Hospital Leadership Forum. Retrieved 10 July 2014. 1 2 3 4 5 Knox, Dennis. "District Hospitals' Important Mission". Payers & Providers. Retrieved 10 July 2014. ↑ Roderick E. McGrew, Encyclopaedia of Medical History (Macmillan 1985), pp.134–5. ↑ Legge, James (1965). A Record of Buddhistic Kingdoms: Being an Account by the Chinese Monk Fâ-Hien of his Travels in India and Ceylon (A.D. 399–414) in Search of the Buddhist Books of Discipline. 1 2 The Nurses should be able to Sing and Play Instruments – Wujastyk, Dominik; University College London. Archived 27 February 2008 at the Wayback Machine. ↑ Resource Mobilisation in Sri Lanka's Health Sector – Rannan-Eliya, Ravi P. & De Mel, Nishan, Harvard School of Public Health & Health Policy Programme, Institute of Policy Studies, February 1997, Page 19. Accessed 22 February 2008. ↑ Ayurveda Hospitals in ancient Sri Lanka – Siriweera, W. I., Summary of guest lecture, Sixth International Medical Congress, Peradeniya Medical School Alumni Association and the Faculty of Medicine Archived 7 June 2008 at the Wayback Machine. ↑ Catholic Encyclopedia – (2009) Accessed April 2011. ↑ James Edward McClellan and Harold Dorn, Science and Technology in World History: An Introduction (Baltimore: The Johns Hopkins University Press, 2006), p.99,101. ↑ The American Journal of Islamic Social Sciences 22:2 Mehmet Mahfuz Söylemez, The Gundeshapur School: Its History, Structure, and Functions, p.3. ↑ Husain F. Nagamia, [Islamic Medicine History and Current practise], (2003), p.24. ↑ Medicine And Health, "Rise and Spread of Islam 622–1500: Science, Technology, Health", World Eras, Thomson Gale. ↑ Toby E. Huff (2003). The Rise of Early Modern Science: Islam, China and the West. Cambridge University Press. p. 191. ISBN 978-0-521-52994-5. 1 2 3 4 5 6 7 8 9 10 11 12 13 14 15 16 17 18 Orme, Nicholas; Webster, Margaret (1995). 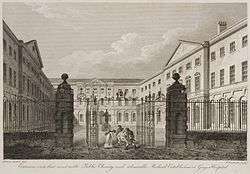 The English Hospital. Yale University Press. p. 49. ISBN 0-300-06058-0. ↑ Watson Sethina (2006). "The Origins of the English Hospital". Transactions of the Royal Historical Society , Sixth Series. 16: 75–94. doi:10.1017/s0080440106000466. JSTOR 25593861. 1 2 Bowers, Barbara S. (2007). The Medieval Hospital and Medical Practice. Ashgate Publishing Limited. p. 79. ISBN 978-0-7546-5110-9. 1 2 3 4 5 6 7 8 9 10 11 12 Abreu, Laurinda (2013). Hospital Life : Theory and Practice from the Medieval to the Modern. Pieterlen Peter Lang International Academic Publishers. pp. 21–34. ISBN 978-3-0353-0517-3. ↑ The Hospital in Islam, [Seyyed Hossein Nasr, Islamic Science, An Illustrated Study], (World of Islam Festival Pub. Co., 1976), p.154. 1 2 3 4 Rawcliffe, Carole (1999). Medicine for the Soul: The Life, Death and Resurrection of an English Medieval Hospital- St. Giles's Norwich, c. 1249–1550. Sutton Publishing. p. xvi. ISBN 0-7509-2009-2. 1 2 3 Clay, Rotha Mary (1909). 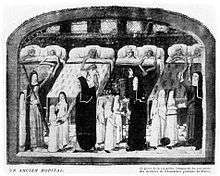 The Medieval Hospitals of England. London: Methuen & Co. p. 77. ISBN 0-7905-4209-9. ↑ Reinarz, Jonathan. "Corpus Curricula: Medical Education and the Voluntary Hospital Movement". Retrieved 17 December 2012. ↑ Michael Marks Davis; Andrew Robert Warner (1918). Dispensaries, Their Management and Development: A Book for Administrators, Public Health Workers, and All Interested in Better Medical Service for the People. MacMillan. pp. 2–3. ↑ Waddington Ivan (1975). "The Development of Medical Ethics - A Sociological Analysis". Medical History. 19 (1): 36–51. doi:10.1017/s002572730001992x. ↑ Porter, Roy (1999) . The Greatest Benefit to Mankind: A Medical History of Humanity from Antiquity to the Present. New York: W. W. Norton & Company. pp. 316–317. ISBN 978-0-393-31980-4. ↑ Kathy Neeb (2006). Fundamentals of Mental Health Nursing. Philadelphia: F.A. Davis Company. ↑ Johnston, Martin (21 January 2008). "Surgery worries create insurance boom". The New Zealand Herald. Retrieved 3 October 2011. ↑ "Emergency Medical Treatment & Labor Act (EMTALA)". centres for Medicare & Medicaid Services. Retrieved 17 May 2013. 1 2 Healing by design – Ode Magazine, July/August 2006 issue. Accessed 10 February 2008. ↑ "The psychological and social needs of patients". British Medical Association. 7 January 2011. Retrieved 14 March 2011.